The followers of Christ through the ﬁrst centuries of the Church conceived of themselves, from the very beginning as a community of prayer. The New Testament, especially the Gospels and the Pauline epistles, are teeming with references to prayer and exhortations for Christians to follow suit. Perhaps, the Gospel that best exemplifies this attitude of the prayer is that of the Gospel of St Luke. It is here that Jesus tells his disciples a parable about the necessity for them to pray always without becoming weary. A few chapters later, Jesus exhorts his followers: “Be vigilant at all times and pray that you have the strength to escape the tribulations… and stand before the Son of Man.” In the Acts of the Apostles, the sequel to the Gospel of St Luke, we find the fulfillment and realisation of these instructions to keep vigilance in prayer, as we had read in today’s first reading. At the beginning of St Luke’s second volume, i.e. the Acts of the Apostles, he records the story of the Ascension of the Lord. The Lord delivered to the disciples the program of their existence devoted to the mission and evangelisation. But till the coming of the Holy Spirit, the Lord makes it clear that they must wait in Jerusalem – not just any idle waiting, or a waiting filled with frenzied activity, but a prayerful vigilance. Therefore, it is in Jerusalem, the Apostles are gathered in the house to pray, and the reward for their prayerful vigilance is the gift of the Holy Spirit at Pentecost. This Sunday reminds us of that illuminating truth, a truth that is often neglected or forgotten, that at the heart of the Church lies prayer. In this context of waiting, between Ascension and Pentecost, St. Luke mentions Mary, the Mother of Jesus, for the last time. In a way, St Luke wishes to parallel the narrative in his gospel. He dedicated the beginning of his Gospel to Mary, the announcement of the angel of the birth and infancy of the Son of God made man. And here at the beginning of the Acts of the Apostles, the account of the birth and the beginning of the mission of the Church, Mary stands not only as witness but as a model for prayerful recollection. Of course, the Church sees in Mary more than the historical and biological association with Jesus. The Church sees in her an icon, an image and mirror of herself. Mary symbolises this important truth, that prayer lies at the very heart of the Church. Thus, this unassuming record of the presence of the mother of Jesus amidst the Apostles gathered in prayer, is a fitting summary of her life and ministry. Throughout the Gospel of St Luke, she is the exemplary model of prayer, from the theologically articulate Magnificat to the contemplative reading of the events in her Son’s life. Mary was a witness to the historical unfolding of the saving events, which culminated in the Redeemer's Death and Resurrection, and she kept “all these things, pondering them in her heart” (Lk 2:19) She was not merely present as an observer, nor did she merely follow the events as a doting mother, but sought to grasp their deeper meaning, adhering with all her soul to what was being mysteriously accomplished in them. And now in the Upper Room, after the ascent of her Son to heaven, and in the quiet atmosphere of listening and prayer, she is present once again. After this, she disappears like her Son. Where Scripture remains silent, the Tradition found among our Eastern brethren is that Mary retreated into prayer and contemplation for the rest of her life. Her mission on earth has ended. Her intercessory mission in heaven has only begun. This poignant scene of the first Christian community with Mary in their midst, consumed in prayer provides two points of reflection. The first is a correction to a common myth, that prayer can only be accomplished in the midst an environment free from distraction and trouble. On the contrary, this first novena of the Church, demonstrates that prayer can take place even in the midst of confusion, anxiety and chaos. This is beautifully articulated in a pictorial manner by the traditional festal icon of the Ascension. It depicts of the scene of Ascension and the gathered apostles on the Mount of Olives. 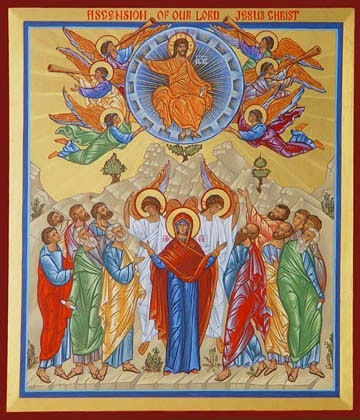 But the icon does more than show the historical event of Christ’s ascension; it also symbolically depicts the Church. Of course, the primary figure is that of the ascending Christ in the upper portion of this icon. But our reflection today draws our attention to the lower half of the icon, where the Apostles flank and surround Mary. Here on the Mount of Olives, we see how the icon captures two movements - it contains both confusion and peace: the former is borne of worldly reasoning, whilst the latter comes from a humble submission to the heavenly order. The distinction between heavenly peace and worldly confusion is most apparent in the distinction made between Mary and the Apostles. The Apostles look up in a combination of fear and wonder. Two angels exhort the men to cease their gazing into heaven and return to Jerusalem to receive the promised gift of the Holy Spirit. At the centre stands Mary the Mother of God, hands raised in prayer, not staring up, but peacefully toward us. Mary appears to understand the deep mysteries of her Son’s birth, death, resurrection and ascension, already hoping for Christ’s return. This hope brings her the divine peace. She, like Jesus and the angels, possesses a halo signifying the grace and glory of God, whereas the disordered Apostles do not. They are unenlightened. The icon also highlights the second point that I wish to make. Mary is firmly anchored by prayer at the very centre, whereas the Apostles are struggling with the urge to depart, to leave that very place, to begin their urgent ministry of evangelisation. The icon exudes this tension between prayerful stillness and troubled activity. Often, many in the Church are tempted to abandon prayer in favour of activism, measuring success by what they do and can accomplish. It’s almost as if we are saying, “Jesus is gone, now it’s all up to us to save the world.” In the context of a world that is so obsessed with efficiency and productivity, one is quickly conquered by this dangerous temptation of activism, as though salvation depended upon us. The world of today is even more fascinated with activism that it has lost the sense of contemplation. Prayer is seen as a waste of time, a sign of escapism. But prayer is the motor of mission. In fact, mission and evangelisation depends first of all upon prayer and the primary initiative of God who precedes our initiatives. All activities are empty without the necessary foundation of prayer. Mission begins in the Upper Room, the Cenacle, with prayer. Without prayer, which is the soul of all apostolate, evangelisation becomes proselytism, propaganda, or a publicity campaign. The peaceful image of the Mother God, prayerfully and peacefully entreating God, therefore invites us to do the same, and to abandon our desire to right every wrong, but rather to unite ourselves with Christ, who is the world’s true Saviour. Venerating the Mother of Jesus in the Church, then, means to learn from her to be a community that prays. Mary invites us to turn to God not only in need but in a persevering and faithful way. Mary teaches us the necessity of prayer, the need to be centred in prayer, and shows us that only with a constant, intimate bond, full of love with her Son can we emerge from ourselves, with courage, to reach the ends of the world and proclaim everywhere the Lord Jesus, Saviour of the world.